If you’re a new blogger then you know trying to generate traffic is freakin’ hard. And it’s not like you’re trying either. You know exactly what to do to drive visitors to your blog. You know Pinterest is the way many bloggers are growing their blog traffic so what do you do? You jump on the Pinterest train and start pinning the crap out of your content. You also heard that Facebook groups are a goldmine for traffic, so you start joining every and any group you think your target audience hangs out. You know the common ways to bring traffic to your blog. But, it’s just not working. No one is commenting, you aren’t getting many shares, and you barely have any followers; so, what gives? What are you dong wrong? Nothing really. You’re just not doing ALL the things you could be for driving traffic back to your blog. Now before I get into my post, I know full well that SEO and keywords are a HUGE help in generating traffic to your blog. The thing with SEO is that it takes time for it to work. For me, it took around four or five months before one of my posts to rank on the first page of Google. But trying to fit SEO in the first three months of blogging shouldn’t be your sole focus. Instead, be natural and write for your audience! So what other ways besides the common ways can you get more blog traffic? Here are seven other ways that helped me and will help you now! When I found out about this traffic generating trick, I couldn’t believe how great and quick it worked. Whenever you leave a comment, on the spot for your name, put your name and your site’s name too. I use the | spacer instead of the @ symbol (sorry, my brain can’t think of the real names of those). The @ symbol can be used, but with some commenting programs, it’s viewed as a spammy comment and puts your comment in spam. I’ve had much more success using the | symbol. When I comment, I noticed I get a bit more traffic back to my site, which rocks because every little thing counts right? I’m sure you’ve heard the opposite of what I’m about to tell you. That it’s much better to post one great long and value-filled post rather than two or three tinier and more fluffy type posts. Well, that’s not the whole story. Instead of posting great posts once a week or once a month, post good posts twice a week or more. In the beginning when you have your new blog, you need pages on your site. Google needs to index your posts. You want people to stay on your site longer to improve your bounce rate. All of these metrics help improve your overall blog’s profile and helps you with growing your traffic (because you can promote more). Now, why would I say this when I’m a freelance writer? I mean, I get paid to provide some hella good long-form content to my clients. But, I know for a fact that the more I posted, i.e. the more frequent I posted per week, the more traffic I generated. For awhile I’ve been writing a post once a week. Most of these posts are informational, actionable and full of great tips. My pageviews for September dropped from 21k to 17k. Ouch! Last week was the first week I posted twice. Within a day of doing this, my pageviews went from 17k to 18k. Now, it’s not a huge jump, but at least it’s going in the right direction. So, take it from me, post more often!! Try to post at least 1k words for each post, though. You still want quality for each post you publish. If I could, I would post three times a week. But, I also have another blog where I post once a week and I have my client work. But I always make a goal to write two posts on Twins Mommy. An easy way to find a new audience is to guest post. Guest posting just means writing a post on someone else’s blog. There are many places where you can get paid at least $100 when you guest post too. Win-win there! For me, since I get paid to write, it’s hard for me to find the time to guest post, but I’m trying to make this a priority. I recently became a contributor for Huffington Post and will hopefully have my post published soon. I also had a guest post on Living for Naptime, and I’m working hard on two other ones. The goal is to find a blog to guest post on that is more established than yours. They have more traffic, more subscribers and aren’t a new blog. But, that’s not to say that you can’t guest post on those blogs. It just might not bring in a lot of traffic in the end. The higher the domain and page authority, the more popular and established your blog is. For the normal blogger, if your DA is 30+ that’s good, 40+ is very good, and anything over 50+ is great. You can use this to help decide where you want to guest post if you want. One of the things I did early on and that helped me grow my blog quick was to do round up posts and feature other bloggers. In the beginning, since you don’t have a lot of content, you’re going to be linking to external blogs, so why not feature those bloggers too? 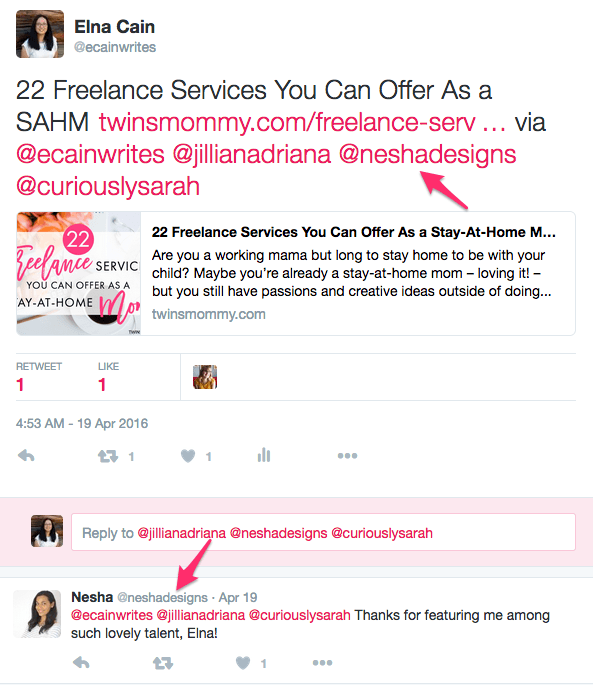 One of my first roundups was 22 Freelance Services You Can Offer as a Stay-At-Home Mom. From here I made sure to tag the bloggers I mentioned in my tweets. This helped me reach a new audience if the blogger RT’d my post or at least opened a door of communication with the blogger. So, go ahead and feature other mommy bloggers and let them know! I love it when I receive an email letting me know that my Twins Mommy blog was featured! Facebook groups are awesome for traffic generation. If you belong to a group where your target audience hangs out and if the group has promo threads, then you can promote your post in front of your ideal reader. But, did you know that you can also generate more blog traffic by helping other bloggers and not just by using the promo threads? The trick is not to make it look spammy. This is what I mean by spammy: Someone asks a question on how to use Pinterest to bring traffic to their blog and like ten people comment leaving blog posts, email courses, products and more. Yeah, not the best way. A better way is to give value when you answer a question a blogger has. This is how it works. If you notice a question in a FB group that you can help out, provide a response that doesn’t promote your blog in any way, but rather, promotes your knowledge. As you can see not only did the blogger who asked the question responded to my comment, but other bloggers were thankful for that tip. Now, how does that bring traffic to your site? Well, if the blogger or anyone is interested in getting to know you more, they can click on your name and find out more about you. And if you’re smart, you would have updated your personal profile to include your blog! People can then click and look at your blog 🙂 BOOM! Traffic. Do you have an email list yet? If you want to start monetizing your site, you should start a list ASAP. But, don’t get in the habit of emailing them periodically. A lot of bloggers email infrequently even when they have a product or are monetizing their blog. Why? Well, I’m not sure but maybe they feel they can’t provide value every week or sending more than one email a week is way too much in their opinion. In either case, if you want to build a loyal tribe of followers, you need to make that connection on a weekly basis. Don’t be scared to email your list multiple times a week if you’re selling products. But don’t go crazy. Three times a week is pushing it, but if you “train” your list, they will come to expect an email from you in their inbox. And it’s a great way to let your subscribers know what’s happening on your blog. With my emails I tell my subscribers about my latest blog post and I try hard to also provide more tips and value that you can’t find on the blog. One of the best ways to get traffic to your blog is to network with other bloggers in your niche. 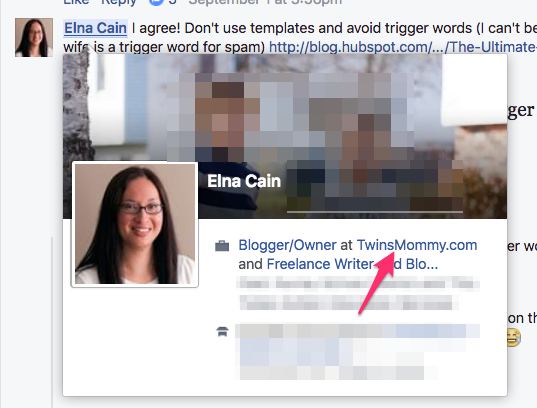 When I started Twins Mommy, I didn’t know many mommy bloggers at all. 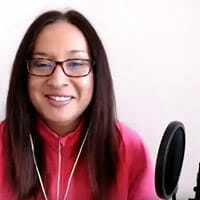 I was and still am following the big influencers like Allison from Wonderlass, Melyssa Griffin, Caitilin Bacher and Kristen from Believe in a Budget. I had to search on Pinterest and Facebook for more mommy blogs and mompreneur blogs to start to follow. But, once I found them I was immediately welcomed by this wonderful group of mom bosses. And that opened the door for me to feature them on my blog. I love collaborating with other bloggers. It’s like two bloggers are stronger than one. And it’s like we aren’t competing either even if we are in the same niche and have the same target audience. We are all here to help each other out and to share our tips with a bigger audience. Around three or four months after starting Twins Mommy, Candis of Smart Mom Blogger was letting people know that she was doing these 10-minute webinars for mommy bloggers. I signed up to participate, and a few weeks later we did our little webinar. If you want to learn more about another blogger, go ahead and sign up for their email list and email them. Ask them a question and get their advice. Every day I get replies from my welcome email series asking for my advice, and I love it. They enjoy my emails and love my content. If you’re new to blogging, go ahead and email another mommy blogger and start a relationship. You never know, doing that can turn into doing joint webinars or interviews. And the more you reach a new audience, the more traffic you’ll generate for your blog. If you follow me, then you know I have my struggles with generating more traffic. SEO and backlinks can really help your blog get noticed and get traffic. But that takes time and it takes nurturing. And with all the other common ways to gain traffic, it can still be a challenge for many to reach even 5k pageviews. That’s why these other seven ways to drive more traffic to your blog can totally help you out. 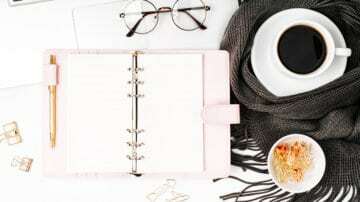 The biggest takeaway from all this is to connect with your target audience and connect with bloggers in your niche. It’s a little easier when we band together! Over to you – did this help you out? How do you drive traffic to your blog? These are great tips! I just started a blog and I’m trying to figure out how to get people to actually view my website. I’m for sure going to use your advice and try making connections with other college bloggers like me! That’s awesome! Yes, connecting is key to making you blog grow! Good luck! Thanks for these great tips. Learned a lot. Connecting with other bloggers is my new goal now. Thanks again. Yes! That’s the backbone to a strong and successful blog. Have fun networking and connecting with other bloggers! Thanks for this! I think it’ll be really helpful for me! Thank you Elna for this helpful tips. I have been learning a lot from you. That’s great to know! Glad you stopped over here! So good. Definitely working on the guest posting angle and I’m going to try some of these other ones, too! Thanks! That’s awesome! Yes, guest blogging is a great strategy to broaden your audience reach! Thanks for the awesome tips! I’ve been using the @ sign when commenting, but now I’m going to switch to the spacer. I didn’t even know how to use it before reading this, but now that I found it, I realize it looks much better. It does, doesn’t it? I thought so too! Glad you are using it and finding other ways to boost blog traffic! I have just set up a new travel / life change blog and working hard to build a following via social media etc. It is great to get more tips and hints and just keep hoping that with time and work the traffic will grow! Congrats on your new travel blog! How exciting! Yes, keep your head down and create amazing content and attract the right traffic!! As I am about to step off the proverbial cliff and into the world of blogging, I am sooo glad I bumped into your very informative blog. Also just launched my website. Learned so much from it; now of course to apply the wisdom you so generously share. Thanks so much! Congrats on starting a blog! The fun parts begins 🙂 Can’t wait to read all about you on your new blog! Loved reading the info – going to try this out! I’m a first time blogger newbie so I can use all the advice I can get! Any other tips? I’d love it if someone can check out my blog and see what needs more work? I’m hoping to grow more by trying all these out! Again Thank You! That’s great and thanks for coming over! I do have a lot of blog posts about increasing traffic. Just search for “blog traffic” on my blog to find some! You’re welcome! Glad this post resonated with you. Getting traffic from any place is a challenge when you’re a new blogger. Organic traffic is the hardest and takes the longest! This was SOOOO helpful! I never knew the name trick.. I will try that from now on!!! You’re welcome! So glad you found a hack to get more eyes to your blog! I am reading all I can on getting traffic but none of it will work any suggestions? Also your blog was still really helpful. I was reading your comment and getting ready to jump over to your blog but I see your not exactly ready yet. When you get on board, let me know and I’ll subscribe. Thanks so much! First get a domain and start writing some posts and then get on social media! From there you can get readers! Thank you for sharing honest tips here. I’ve worked in the SEO industry about a decade earlier and things changed after I left it for quite a while. And also, sometimes, some things just don’t work as much as it worked for the other. Hopefully, after me getting broke, I can get back up to hosting my blog and avoiding free hosted ones. I know it’s a bad move but no one to blame. Thanks for stopping by! Yes, it is a challenge to grow your blog on a free hosted plan, but it’s better than not eh? You can always change from free to a self-hosted plan when you’re ready! Informative！Nice Job Elna! I always take SEO into consideration when I plan to write a new article on my blog. Keyword Analysis is for sure of great concern. What’s more, interactions on social media and backlinks play roles as important as keywords. I’d like to show my views. To attract free traffic, sites like StumbleUpon, Digg, Quora and Reddit are worth a shot. Also, paid guest post is a quick way to draw more traffic. For example, I’ve done a guest post on FonePaw, a tech site and it gets quick traffic than the others do. Great tips. Yes, SEO is essential in the long run but in the beginning, leverage social media for traffic. I’m not a big fan of bookmarking sites like StumbleUpon but if you find your audience resides there or on Reddit then that’s where you have to hang out! For me, my audience is primarily on Pinterest and Facebook! Ditto on guest posting! It’s a great traffic source! Love your honesty and easy to follow (and proven) steps to get more traffic Elna! It is important to be consistent and work on content that is both high quality, helpful and fun all at the same time! I have seen better results in the past few months and it encourages me to keep networking, engaging with others and be part of awesome Facebook groups like yours! Thanks so much! Glad these tips will help you with growing your traffic! Thanks for joining my FB group! Thanks for the great ideas. Myself and 2 friends started a blog in the last month and are struggling to get more traffic to our site. We are defiantly going to use these! That’s awesome. Crossing my fingers your traffic grows and grows and grows! This is a fantastic post! As a newish blogger, you definitely drive home the fact that we need to reach out to other bloggers. Something that I think is quite intimidating to so many of us! But as a successful blogger, it’s nice that you encourage it and throw out some suggestions! Thanks so much! Yes networking is the LIFE of your blog for sure! You can’t do this alone! Hi! Thank you so much for this article. I can’t wait to read your other stuff! I’ve been an online direct sales retailer for over a year, but my son was recently diagnosed with special needs and I needed a way to really kick things up a notch. I started my blog a few weeks ago with absolutely NO knowledge of what I was doing… and I’m still pretty lost! I can’t wait to try out your tips! That’s great! Yes, learning to blog is a big thing for sure! Have you considered my traffic course? It will help you with the most important thing…getting eyes to your blog so that you can start making money! I’m learning a lot everyday and your blog has been very helpful! I hit a wall and your blog kickstarted me again! That’s the best comment I’ve heard all day! I’m so happy you are growing your blog! Yay! Thank you for sharing this info! I have been blogging for over a year, and my traffic’s total is 1300. It has been a major struggle to get the exposure I need. I will definitely try these steps and see how it goes. I’ve already begun posting more frequently (2x a week) to drive traffic. My weakness is networking, and most of your steps require some form of networking. I will have to get out of my comfort zone if I want my blog to become my business. Trying to get traffic to my new site, will be implementing these tips for some improvement, thanks for sharing! Hello Elna, I really love your post and I’m definitely using the tips! Hi Elna, thanks for putting this together. As a new blogger I appreciate all the advice you give. Love this post! So glad you found some good traffic tips! Wow! Fabulous piece of work. I love all your tips, especially those with examples. I have been fishing around for tips and tricks to grow my blog traffic and this post simply is very informative. I personally love reading about the journey a blogger/entrepreneur makes and am all set to start setting up the time to read your posts from the beginning 🙂 Loved it! These tips are wonderful! Thank you for the advice! You’re welcome! I hope your blog takes off! Great tips! I look forward to using them on my new blog! Thanks Elna for providing such a useful information. I like your idea about commenting on others blog. I hope this will be helpful to increase my blog traffic. Thank you! Glad you found a good tip! ohhh this post rocks! Thank you so much ! I have a new blog and Im trying to get more traffic. I def. plan on doing a roundup of some blogs i love. Thank you again! That’s great to hear! Yes, round ups are quite easy to do and it helps with getting your share count ups! Thanks for this great post. I think SEO is the best way to increase traffic. just focus on great content, high-quality backlinks, and social shares. Yes, SEO is key, but it takes a long time and there’s a lot of research that goes into it. If you can utilize social media and even SEO on Pinterest, that’s better for newer bloggers! Thank you so much for taking time to write this article! I am new to the blogging world and searching for tips and tricks to implement. This has been wonderful and very easy to follow. I can’t wait to start! You’re welcome! 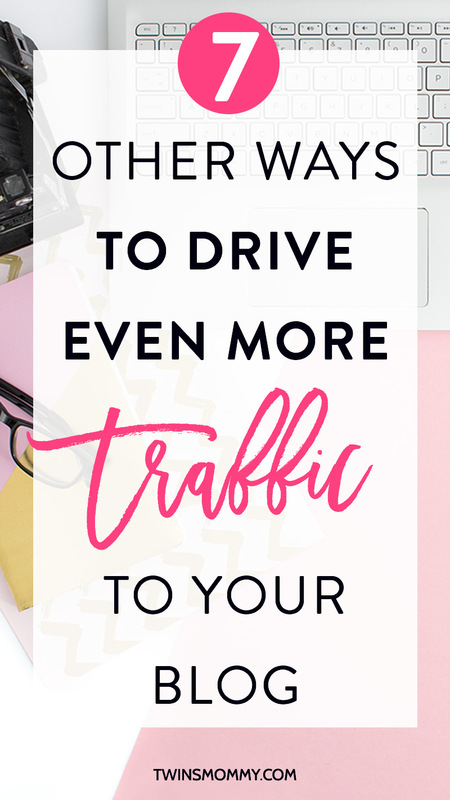 So happy you found some tips to help you drive more traffic to your blog! I really loved this post it really helped me get great ideas. It has been a slow go for my traffic to even reach 50 a day or even 20 or 30 a day Im around the 10 to 18 users a day that is sad. Hopefully your traffic generating teqniques will help. I took a look at your blog. It seems that your niche is varied. It might be a good idea to niche down and focus on one topic (maybe Christian living?) Then join relevant group boards in that niche. Good luck! Wow! I never thought of adding the name of my blog with my name or featuring other bloggers on my blog! I will definitely start implementing these tips! That’s great you found a new traffic tip 🙂 I love doing this and now it’s just second nature. I’m 5 months in and still struggling with blog traffic. I know it takes some time, though. I started frequenting Facebook groups and that’s helping a bit. My next plan of attack is guest posting. I love your idea of doing round-up posts, so I think I will give that a try. Did you have to clear it with the other bloggers that you featured? I know it’s just a link to their site with a nice introduction and explanation, but I don’t want to step on any toes. I usually tag them after the fact and they enjoy it. I’ve had only one person say not to feature them… but most of everyone wants the backlink and traffic. Try it out! Be on the lookout for my 3 tier traffic generation course soon! What a great post! I just started my blog and the struggle of gaining followers and subscribers seems like an uphill battle! I know I have to be patient and I am doing lots of reading in this area but your tips are so great! I will be sure to start them ASAP!! Thanks so much!! You’re welcome and so happy you found some useful tips. Growing your blog is a challenge for sure but consistency is key! Good luck and email me if you need help! I have enjoyed this information and will be using some of these suggestions, as a new blogger myself it is very helpful to know someone cares enough to share info. Gosh I am at a loss to know if I am on the right track with my bog and probably not the first person ever to feel this way.. Thank you so much. Yes, it does take commitment for sure to get more traffic to your blog, but I know you have it in you! Thanks so much! How exciting. I know you’ll do great. Great tips! I really need to work on growing my traffic. Thanks for the ideas. I have trouble squeezing in work between taking care of my little girl. I get the most work done during nap time and after bedtime. That’s the same with me, but now my twins don’t nap! Ha..I do my email when they wake up in the morning and I have my coffee. Then I do “quiet time” for about an hour. This is when I catch up on social media and do blogger outreach. At night when the twins go down for bed, I do my client pieces and blog posts for my blogs! It’s a lot for sure and now I’m devising a course too! These are awesome tips I need to start working on. I’m struggling with traffic and these tips are very different to what I have read and hopefully will make a huge difference on my blog (still trying to reach at least 1k views). My biggest traffic referral has been Stumble Upon so far. Thank you for this wonderful advice! Cheers! Thanks! My work/life balance isn’t really balanced at all. Right now, my twins are in the ottoman, playing with their stuffies and ninja turtles while I’m doing my morning coffee and laptop session 🙂 ha..
And the party continues! Refuses to die! Lol. I’ve saved a mountain of pins for new bloggers, but found much more usable info in this one post than I’ve found in any other single post. And I loved seeing other bloggers I enjoy comment on how helpful your tips are. Let’s me know that even established bloggers don’t have all the details worked out. That tells me that I don’t have to know everything before publishing my first post. LOL. It’s the feeling that I don’t know enough that’s kept me from publishing my first post. I feel much more comfortable now thanks to the information you’ve so generously shared here. Thanks tons! I’ll soon be blogging at The View From the Top of the Hill. You’re welcome! So happy to help you out and give you tips to grow your blog. Good luck! I’m super late to the party here but thanks for the tips! I am also a freelance writer so I’ve found it a real struggle to sit still and focus on driving traffic to my own blog. Love the idea of featuring other bloggers in a roundup, will definitely try that out! Thanks so much for joining! Yes, roundups are awesome! Great post, as usual! 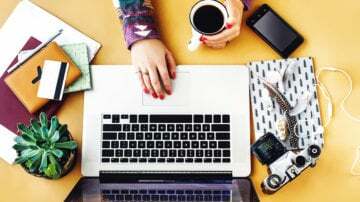 These tips are so helpful for a new blogger like me. It’s a struggle to get traffic, but I can’t wait to try some of these ideas! Question about roundup posts: I’ve been wanting to try one of these, but I’m not sure of the etiquette for using other blog’s images and names. Do I need to ask permission before-hand to include them in a roundup? If I put together a Pinterest-style image with thumbnails from each blog (say, ‘9 farmhouse blogs you should follow’ with a little pic of their decor in a collage), is that breaking copyright? I like the idea of tagging them when sharing on social media, but is that enough? I don’t want to steal images, but it seems like this type of roundup would need some images like that. Thoughts? Sorry this is so long! Thanks for being so awesome! Thanks for coming over and commenting! For your question, when I do roundups where I feature a blogger or blog, I don’t get permission. Most of the time it’s ok. For other roundups where I want contributors, I then ask them if they want to participate. As for screen shots, it’s ok to take a screen shot. I do this all the time for my clients. Just make sure to include a link in your text when you talk about the image (or indirectly. For example, if I’m talking about Caitlin Bacher’s course, I’ll take a screenshot of the course or course package and then in my text talk about that course and link to the page where I took the screenshot). Have fun! You’re welcome! 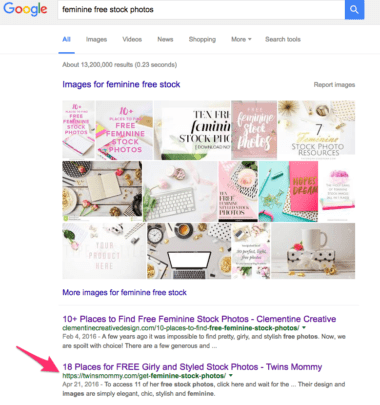 Glad you found some great gems in this post to help you drive traffic to your blog! Thank you Elna. (Notice the name )😬 I never thought about putting blog name in comments or about Spam words. I’ve been stuck in not writing consistently and really need to start. Enjoy gaining knowledge from your posts. I’m in the same boat too. I’m soo sporadic now with this blog! Some weeks I plow through my blog posts and post twice weekly and then I stop and post once a week and like now, I didn’t post at ALL! I’m mad at myself but life gets in the way! Hi, Elna! So, I entered my URL in that Open Site Explorer that you linked to, and my month-old blog came back with a DA and SA of 1! So sad. Just a question, though; what does the “Just Discovered” number mean? Is that how long ago Google found your website? Thanks! You’re still a new site girl so don’t be upset! The more you guest post the more backlinks you can get. It’s a lot SEO strategy that I’m slowly learning. SEO is a beast I say and it’s much easier and faster to grow your DA and SA on social media. Thanks elna. Great tips for traffic generation. I shall be working on it as my blog is very low on traffic. Also tell me do I have to get a proper blog site with domain name or it can be done with free blog? That’s great and I see it! Hi Elna! Can you please explain to me how to go about making my ‘name/blog name’ clickable when posting a comment? I have tried everything I know and done tons of research but I can’t seem to find the right strategy. Thanks in advance! Your name should be clickable when you put your website address in the slot it calls for it. So in your name just type in your name and your blog’s name (not URL) and then in the next slot put your website address and hit submit. Your name should be clickable. Some really great tips here! I’m definitely going to remember these when writing my blog! You’re welcome. Yes, getting blog traffic is hella hard for sure. Any little thing definitely helps. There’s always a ton of different things you can do to drive traffic to your blog. I don’t think I’ve seen you write a post about this yet. I do talk about just commenting in general as a way to bring traffic back to your site. Thanks for coming over! Yeah! It’s an awesome tip when you comment on blogs 🙂 Happy to see you are using it. This tips are so great! I am a new blogger and got to follow this steps right away 😀 Thank you ! Your welcome! So happy to hear these tips will help out your blog traffic! I just love all of your tips and posts! I look forward to your posts every week! Thank you so much 🙂 Hearing this is so amazing for all of you 🙂 So happy that I can offer some help for your blog and biz. Excited that my email made it into your blog post! LOL!!!! Love it! I have a few (new) questions for you, ha! If I mention another blog that I like or that I’d like my readers to check out, do I need to get permission from the blogger first, or can I just link away? Also – I am twitter illiterate. Do you have any guides, a post perhaps, on “twitter for dummies”? ha! I need to be schooled! Can’t get enough of this blog, lady! Keep it up! Thanks so much and you’re welcome 🙂 As for linking to another blog or blogger you don’t have to mention it unless you feature them. So for example, if your post is about X Top Beauty Hackers on YouTube you can feature each lady and then you can tag them on Twitter or FB or email them letting them know that you featured them and would love a share! Make sense? As for a how to start Twitter, I actually don’t know a precise blog post, but Social Media Examiner was the site I went to when I had no clue about Twitter either 🙂 I was reading and I was like, “What’s a RT? What does @mention mean?” So yeah, I’ve been there. Makes perfect sense! And I will definitely check that out for Twitter! You and your blog are SO helpful – which is why I’m a fan! Thanks so much Jill! Good luck and you can follow me at @ecainwrites and I’ll make sure to follow you back (as long as your pic and name match up or else I won’t know it’s you!). Thanks for the tips! I’ve recently discovered your blog and am addicted, even though my niche is completely different! (I’m a wedding photographer). I love learning from people in other niches though and seeing what I can apply to my business. Ha, that made me smile. So happy you found me! and enjoy my content. I always speak to just mommy bloggers but there are so many bloggers and entrepreneurs out there that need to grow their blog, list and income! 🙂 Thanks for the reminder. Momma, you are the queen of comments! 🙂 And I’m so happy you appreciate my auto retweet – I was worried that it may be bothering you! Thanks for letting me know you like it! Thanks so much mama! You are the queen of blogging eh? I’m amazed by all that you do. Especially the tech side of things. You really need to make more videos on all those tech things bloggers need 🙂 I LOVE them. Yes I know, right? Just putting in your website name with your name totally alerts others and makes them curious. Works for me and will totally work for you. Emailing your list is key! I promise you your blog posts provide so much knowledge and inspiration. Glad I found you…I’m a loyal reader. I’m tickled pink knowing that my posts are helpful to you. Good luck on growing your blog. There is so much to do with setting up this blog, I know I need to get to posting! I have a few posts in the works, and your blog is such a gold mine of resources for me. Just to let you know, I totally get more out of your posts than sites that get astronomical amounts of page views. Thank you for all your hard work! If blogs had a testimonial page yours would win 🙂 Hands down. Will take a screenshot of this just so I can relish in your words 🙂 Ha..like I have time as a mom to crazy twins!!! I always use the comment tip now, thanks to you! I have some guest posts lined up for November. I am so excited – hopefully they will all go well! Collaboration is a great strategy to get traffic and MAKE friends. However, my biggest challenge as an introvert is reaching out to people with the intention of friendship. I’m more of a lone wolf-y type. I’m not a biological mom yet, but I’ve raised two kids and your article hits it right. Found your site on the Badass Solopreneur group, I’ll try to keep up. PS: You have a nice site. I think just blog commenting is a good start. Then you can start featuring other bloggers in your niche and @tagging them. From there you can maybe join their newsletter and eventually email them 🙂 Baby steps. You’re welcome 🙂 So happy to hear that these little tips are helpful. Growing your blog is hard and a lot of times you just want to give up! I always love stopping by your blog. It’s so helpful. thanks Elna!! There’s no need to put the www or .com as it registers as a link. Awesome tips! Thank you so much for posting this! As a brand new blogger I am finding that generating traffic is a lot harder than I thought it would be! Also I am learning so much about the importance of an email list. Im going to read your post on that ASAP! Thanks for the great resources for us mommy bloggers! Thank you so much. I’m so happy to hear that you know the importance of list building. I think that’s like #1 in everyone’s books if they want to monetize their blog. I hope you find some great list building tips too! OMG…some of these should be no brainers…but for me? Nope. I pinned this post to remember it! I also stumbled it, so it is saved there too. The pictures are lovely! This is a wonderful post! I absolutely love your first tip! I never thought of doing that. Thanks for sharing! You’re welcome. So happy to hear you found some useful blog traffic tips! Love your blog woman! You are killing it so keep it up. Some great ideas! I will switch my @ to a | in my comments for sure- easy switch! Love the idea of @tagging the people you mention in a post! Also so good to see that people are engaging back…frankly, I think that’s the way it should be!! I know! Traffic can really be a Debbie downer eh? I’m trying to stay motivated and these little things always helps me see a difference in traffic! Good luck. That sounds fantastic. Go ahead and ask me to contribute to your round up if you want! I’m free as always for my mama blogger friends. Great post! I am a new blogger and this is full of great info I can really use! Thanks so much for sharing! So many great tips here, Elna! I didn’t realize the @ symbol could be seen as spam. I will be changing to the little line starting right now. I am also working on a guest posting schedule so that I can grow my blog that way too. Yeah, the @ symbol can be looked at as spam so I avoided that early on. Awesome about guest posting! These are all really great tips! I have yet to get on the email subscriber thing, but I…really should. Hopefully one of these days, I’ll be able to carve out enough time to set that up! You’re in luck girl. Email is my niche (well digital marketing). I have some posts here on this blog to help you so be sure to check those out. Also check out Meera’s blog. It’s literally the best out there for your email list questions and problems. Passing your goodness along, gf! Thanks for the tips, as always! 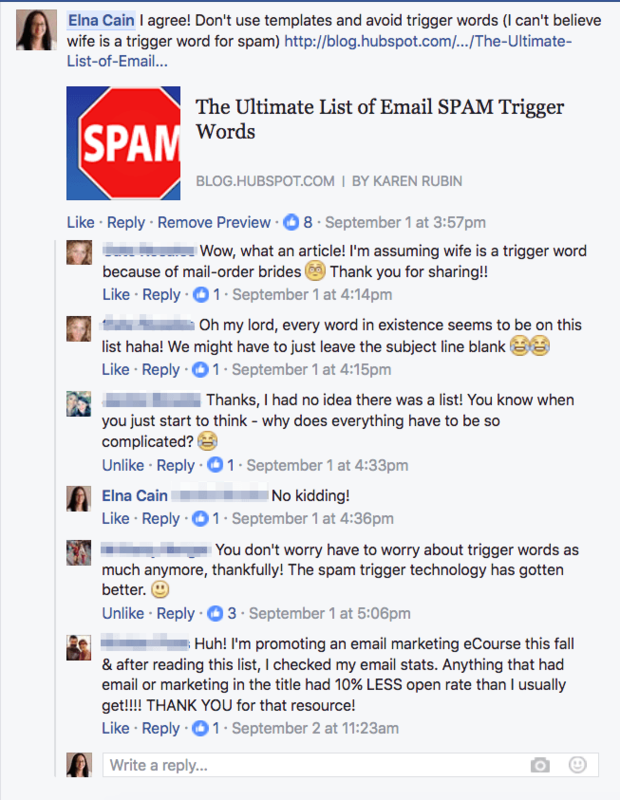 Yes, FB groups are awesome and helping other bloggers really helps YOU! Aww, I LOVE emailing chicas. That’s my thang! I’ll go read what you’re all snotty about it! Hey Elna, love this post! I remember when I was totally new at this, getting any traffic at all was a cause for celebration. And the day I started getting real, consistent traffic that didn’t drop back to zero every few days… well! That was really something. Thanks so much! I know. 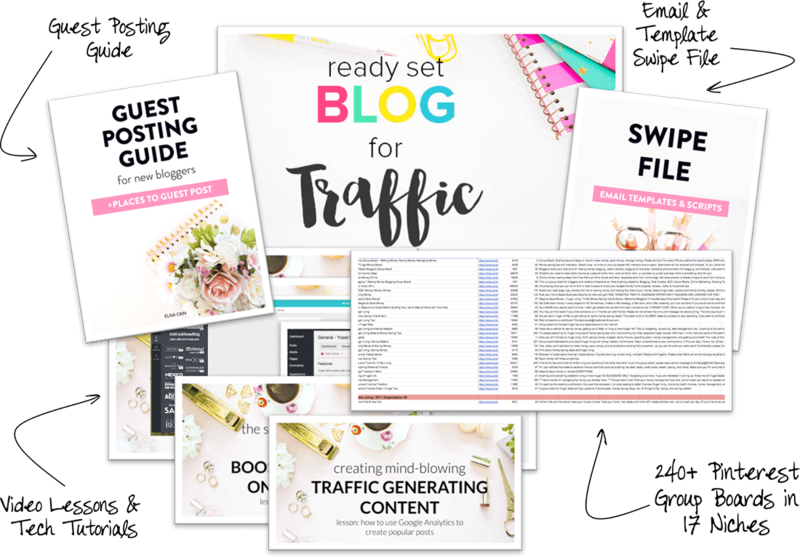 There’s so much that goes into generating traffic to your blog. The BIG things can be hard for many new bloggers, so I thought I’d offer some easier ways that can potentially bring some visitors to your blog.